Our aim is to see your business succeed, and we know what it takes to make your websites succeed. Website design is not what it used to be, and many website design companies have not yet realized this, but we have... Is your website responsve? Is your website mobile and tablet friendly? More than 60% of searches are now done on mobile devices and tablets? Is your website optimized for these mobile devices? 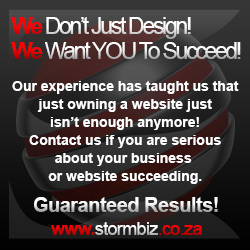 We create a business relationship with you, as we will advise you of exactly what your website needs to succeed. We design, optimize and promote your business website. We will provide you with reports on how your keywords are doing, what your competitors are doing, and what your website needs to do to rise in the search engines above your competitors. Forget about Joe Shmoe who has just finished an html course at school, or the friend of a friend who managed to set up his own site with some free site builder software found on the Internet... nothing can replace the experience of a skilled designer, developer and website promoter.